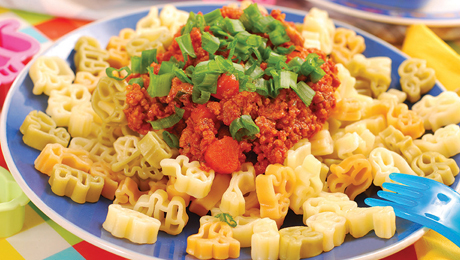 Kids are sure to enjoy this fun pasta recipe. Heat the oil in the saucepan and add the onion, carrot and garlic. Put the lid on, turn down the heat to medium-low and cook for 10 minutes, stirring occasionally. Then add mince and stir it into the onion and carrots. Cook the mince for ten minutes until it is all brown. Then add the tin of tomatoes and the basil or mixed herbs. Bring to the boil, then turn down the heat and simmer for 20 minutes until the meat is well cooked and the carrots are tender. Serve with well-cooked pasta shapes. You may need to cut up the pasta shapes for younger babies.